It's been a little while since I last posted, but I'm still here, still checking for the MW pirates and still hoping optimum reception conditions will come my way again some day! A few minutes ago I heard Professor Sickbok on 1640 kHz with a report for Anton, who had been spinning some records on 1620. Both stations would usually be very strong here - in fact, Anton is often one of the strongest, but tonight reception was not great. A few nights ago even Vrolijke Mijnwerker was only fair, and he has a killer signal when conditions are good. While the propagation is annoying for listeners, it's also tricky for station operators. 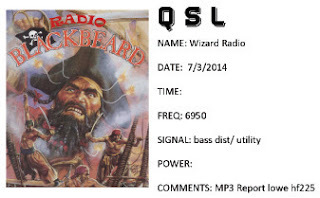 Tonight Radio Blackbeard from the UK was testing on 1636 kHz. He couldn't be heard here, but I'm sure it will be possible later in the year. Perhaps his signal was making it across the North Sea this evening though. He was using an inverted L antenna, used by quite a few of the Dutch pirates, and it's perfectly possible his signal was skipping over to the Netherlands. I'm sure he will be testing again soon, so he is one to listen out for. It's quite rare to hear British stations at the top of MW these days. SW pirate Underground has tried it out in recent times, so it's good to have Blackbeard giving it a go as well. Let's just hope plenty of us get to hear him on the airwaves soon. It's been a pleasant evening here in England with plenty of sunshine and even a little something to listen to on the radio. Radio Pink Panther was coming in very well on 6803 kHz at around dinnertime with some good music as well, and I stayed tuned for a good while. As far as listening to the Dutch pirates on MW goes, conditions remain unpredictable. Sunday evening was pretty good with some powerhouse signals from the likes of Spanningzoeker, Vrolijke Mijnwerker and Pandora, while Zwarte Panter was doing pretty well on 1611 kHz with considerably less power. Tonight, however, it is a different story with no reception other than something very weak from Witte Raaf on 1655, a station that would usually be received really well here.